Although it has been known for years, if not decades, to astute observers of political developments in the Middle East that the rise of the murderous ideology of Islamic fundamentalism is directly connected with the attempts of the leading imperialist powers to strengthen, or extend, their grip on various countries that imperialism has bred, nurtured, aided and abetted fundamentalists in the oil-rich region of the Middle East, ordinary people had hardly any clue about it. Thus, when in July the corporate media revealed the facts about the rescue of the Manchester bomber, Salman Abedi, the collusion between the British state and the fundamentalists became all too clear to ordinary people – to the embarrassment of the imperialist ruling class of Britain, its security services, its political representatives and ideological hod-carriers. We publish below two articles on this question submitted by our comrades in the CPGB-ML. The past of the man who killed twenty two people indiscriminately and maimed another 139 others, half of them children, at the Manchester Arena Ariana Grande concert on 22 May 2017 with bomb and gun before blowing himself up is certainly unfolding publicly in a way that we can only imagine the British state would rather it didn’t. 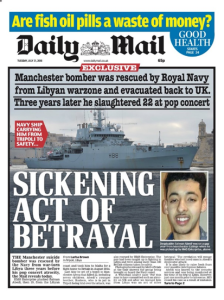 Salman Abedi was born in 1994 and raised in Manchester, the second youngest of four children of Libyan asylum seekers, Samia Tabbal and Ramadan Abedi, who returned to Libya after the imperialist-sponsored counter revolution had murdered President Gaddafi in 2011. It is now thought that when the parents and two of the children (younger brother Hashim and sister Jomana) returned to Libya, leaving Salman and his older brother Ismail behind, they didn’t seem to have any problems with the local jihadi militants, i.e., crazed fundamentalists, who had come to power. This does suggest that they either kept their heads down very successfully, or that they fitted it very well with whichever faction was running the area to where they had moved. They would certainly have been involved in political and/or religious subversive activity against President Gaddafi’s government when they originally lived in Libya to necessitate their having to run to Britain asking for asylum in the first place and, therefore, it must be assumed, they would have enjoyed, from those unsavoury forces and factions that French and British imperialism had trained and funded to overthrow the legitimate Gaddafi government, a real ‘heroes return’. Some of those who had known Salman Abedi in his teens talk of a normal boy but one who was deeply religious, yet Sheikh Mohammad Saeed, the Imam at the Manchester Islamic Centre, also known as the Didsbury Mosque, described Abedi having made a “face of hate” at him after the imam gave a sermon denouncing terrorism. France’s interior minister, Gerard Collomb, has told French television that both British and French intelligence services had information that Abedi had been in Syria and that he had links with Islamic State adding: “all of a sudden he travelled to Libya and then most likely to Syria, became radicalised and decided to commit this attack.” Collomb is asking us to accept that Salman underwent an extraordinarily rapid radicalisation, but in fact he is known to have travelled to both Libya and Syria on several occasions and had been on a UK security watch list, but was removed from it in 2014. Shortly after that, as the uneasy situation existing among the various factions of imperialist-sponsored rats now in control of Libya descended into open warfare, the UN decided to exit quickly. As a result, Border Force officials were deployed to assist with the evacuation of British nationals and their dependants. HMS Enterprise, a Royal Navy ship, was sent to Tripoli with a list of British nationals to pick up. Both Salman Abedi and his younger brother Hashim were on that list, with around 100 other British citizens. After a brief stop in Malta the two Abedi brothers were brought back to Britain. 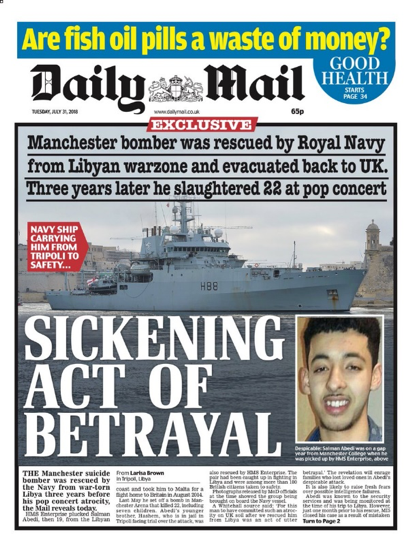 Nevertheless Salman would continue travelling back and forth between Britain, Libya and Syria until just one month before he carried out the Manchester Arena bombing. The younger brother, Hashim, who didn’t return to Britain with Salman after their last trip to Libya, is currently held by one of the militias in Libya as they try to assess his own connections with Islamic State, but, he has openly declared to them (they say) that he shared ideology with his brother Salman. BBC2 have spoken to the people holding Hashim and were told that Hashim had said that he knew something big was to happen in Manchester and that, when he saw the attack on the internet, he bragged, even before the bomber was named, that he knew that it had been carried out by his brother. At the moment the British media are reporting these revelations from an angle of blaming the security services for blunders in not capturing Salman before he attacked and for allowing all the other British jihadis that flowed to both Libya and Syria to come back to Britain with a large sideswipe at all immigrants for good measure. But, if we look at the situation from another angle, i.e., that if Britain and France had not trained and funded the ISIS groups to destabilise and topple sovereign states in the rush to pilfer their oil and stop various projects aimed at building up resistance to imperialism’s gallop to more wars of brigandage; if our rulers had not made it so easy for young Moslems to be radicalised and get to Libya and Syria so freely; if British and French imperialism, with more than a nod from US imperialism, had not been the reason for the mass carnage that followed the adventures into both those states, in the name of humanitarianism of course – then the holy warriors of Islamic State et al would not be targeting the people living in Britain, France and the USA. If the British people would look at the current fears and security regime we live under they may start appropriately to blame British imperialism for every terrorist atrocity that has befallen them. They may start to see the likes of ex premiers Cameron, Brown and Blair as the war criminals that they are and that the schemes and projects of imperialism are never in the interests of workers.